Jacket has velcro fastening.Bag has zip fastening. Jacket, Skirt, Hat and Bag. 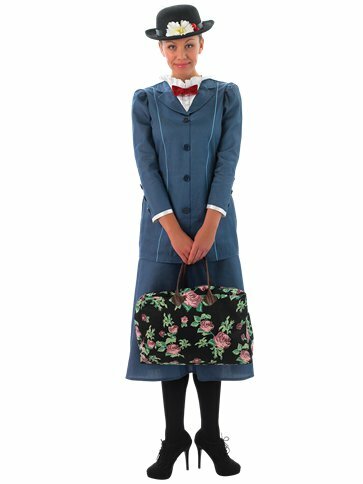 This officially licensed, four piece, Disney Mary Poppins costume includes an all-in-one top with velcro fastening to back, mock button detail to front, attached white ruffle collar with red velvet bow-tie and white fabric trim to cuffs. Also included is a matching skirt with part elasticated waist for comfort, a sturdy bowler hat decorated with daisy flowers and bright red berries and a pretty fabric carpet bag with zip fastener.